I love, love fresh fruits and vegetables in the summertime. I also like being able to prepare dinner early in the morning when it is still cool so I don't have to heat up the kitchen in the evening when it is blazing hot and I am too heat-weary to cook. I came across a yummy salad that is fresh and bright, beautiful to look at, and so satisfying to eat. I found Raspberry-Asparagus Medley Salad on MyRecipes.com. It is also pretty easy to assemble. And at 67 calories per serving, you can't beat the count for the taste. A real winner and a definite repeat. 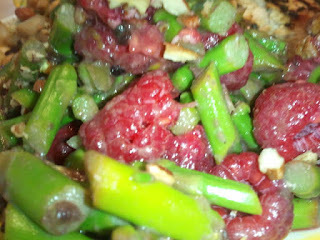 For a complete summer dinner menu, check out my previous blog this week Quick & Tasty 3 Bean Salad.